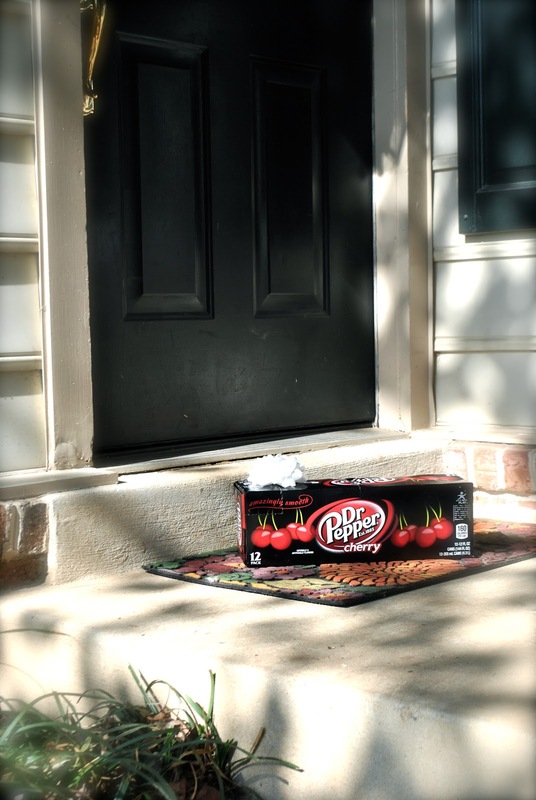 One day last summer, I came home to a 12-pack of Cherry Dr. Pepper just sitting on my front porch. A very wonderful thing to come home to, for sure. This is not the original 12-pack or my real front porch, since we are away from home this year. I had to think for a second--did I put groceries on the front porch earlier and forget to take in the Dr. Pepper?--but I soon realized it was from our awesome next door neighbors, Keith and Leslie (Leslie just happens to work for Dr. Pepper at their headquarters in Plano, Texas--how cool is that?). All of this makes me want to keep a running mental list of all the favorite things of the people I know so I can just randomly make drop-offs on days I am out and think to pick up something . . . such an easy way to put a smile on someone's face. Or--in my case--feed an addiction! Clearly, this is near & dear to my heart. When I visit TX, I always try to load up on the glass bottled Dr. Peppers. It's such a treat. During college (about this time of year actually), I would receive tons of boxes of Peeps from roommates & friends. People knew I loved them & it was such a thoughtful gesture. That makes me want to get some glass bottles! :) I love that reminder about the Peeps, ha! What a fun thing to be inundated with, right?